Depending on the make and model of the car your paint code location varies. 1. Find your make of car from the list below. (e.g Land Rover). 2. Take note of numbers that are next your model (e.g 2,4,6,8). 3. 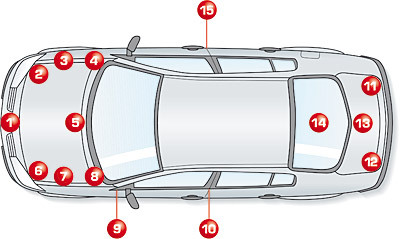 Match your numbers to the locations on the car (see picture below). 4. Simply find your colour code from one of the locations your numbers match to (e.g under the bonnet). 5. Click the link underneath to go straight to the automotive custom filled aerosol page. 6. On the page above type in as many of the box’s possible so we can match the colour as best we can. 7. Sit back and relax. We will now mix the colour and get it delivered withing just 2 working days! If you are still not able to identify your colour code please contact us here and we will try our best to help you. TIP – The more you buy the cheaper it gets!